Three very different front exteriors, yet each one featuring modern flair, found at Gavello Glen. Over the years several of Gavello Glen's homes have been torn down and replaced with larger homes, including one Carol Maa calls a "Frankenstein." In the 1990s the city approved a developer's plan to demolish four Gavellos to make way for dense "affordable" housing. Neighbors fought, reducing the density of the new homes. That is also when the long-dormant neighborhood association was resurrected, neighbors say. 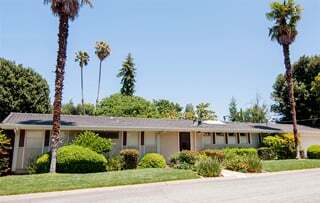 In the early 1990s, neighbors tried to have Gavello Glen designated as what Sunnyvale calls a "heritage housing district," "to prevent higher density redevelopment," as stated in a 1993 letter to the City Council by the then-heritage preservation commissioner. But, says Sharon Davis, secretary of the neighborhood association and past president, "With historic [designation], you couldn't change the designs of houses, you can't do this, you can't do that. And people thought that was too restrictive." Instead they got the city to rezone the area, says Phyllis Chrisman, to reduce allowable density. The city also approved design guidelines, Davis says, to ensure compatibility. But the guidelines have often proven ineffective, she says, as they leave room for planners to interpret them. "You just have to watch them all the time. The guidelines are just that—guidelines." Indeed, Gavello Glen is not a place to tour to see 1950s mid-century modernism at its purest. Although most homes are recognizably Gavellos, there are relatively few that haven't added inappropriate garage or front doors, lighting fixtures, or the occasional bay window. Some have added second stories. But many owners love the architecture, and even when pushing up their ceiling a few feet, a common ploy, retain the Gavello look. And some want to put Gavello Glen on the mid-century modern map, in part to ensure its preservation. A few years back Margaret Jungling proposed setting up a large 'Gavello Glen' sign at a neighborhood entry. The association said no. Eric Boyenga too believes Gavello Glen needs to become better known. 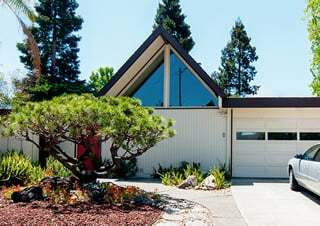 If people really knew about the homes, they could become as desirable as Eichlers, he believes. "If people are educated they will do everything in their power to preserve the value of these homes," Boyenga says. 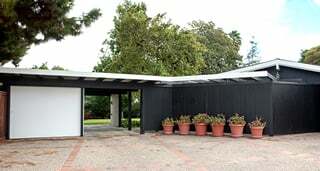 "There will be a time in the future when these Gavellos will have a following, like Eichlers, though it won't be as big, if the information can get out to enough people." During his 1991 talk, Elmer Gavello was asked if it surprised him that many original owners still lived in Gavello Glen and that some of their children had bought homes there themselves. "It does, very much so," he said to laughter. "I'm very happy to know that they're happy here...a nice feeling." • Gavello Glen, south of Braly Park, west of Wolfe Road, and east of Fair Oaks Avenue, includes Iris, Pierino, Henrietta, Gavello, Gail, and Gary avenues; and Jackpine, Duff, and Anshen courts.